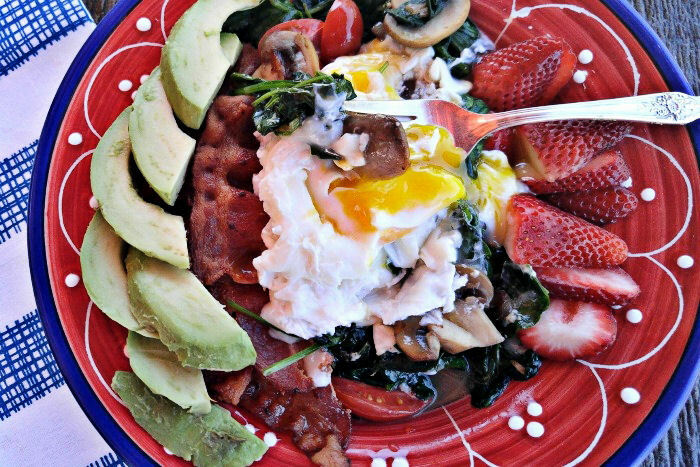 This amazing caramelized mushroom breakfast bowl combines bacon and eggs with fruit, avocados and spinach for one delicious and filling start to the day. 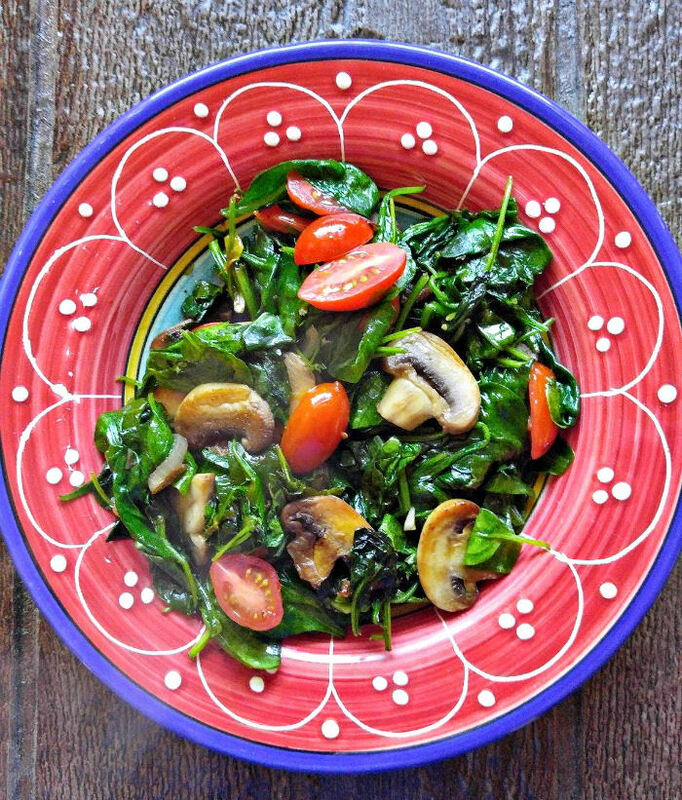 It’s an added benefit that this dish is one of my 30 minute meals, too! 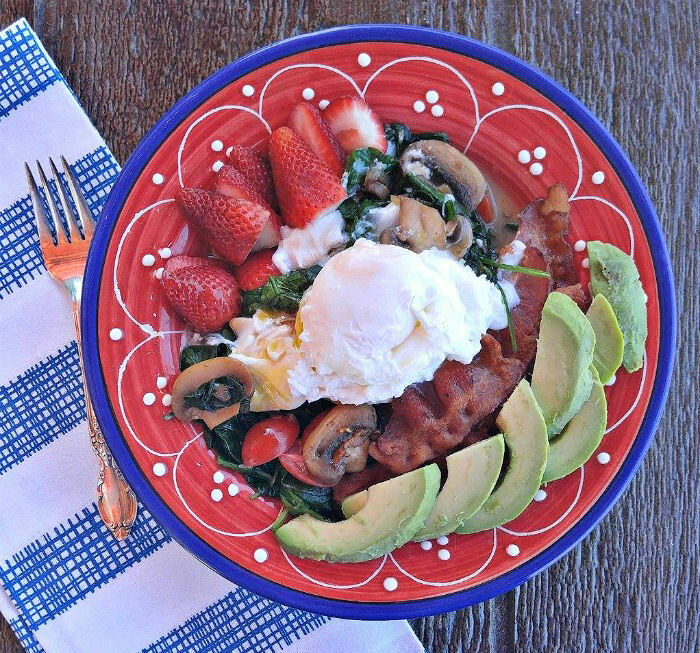 I love a breakfast recipe that can be assembled and served in a single bowl. Doing this allows the flavors combine so that each layer gets some of the goodness of all the ingredients. 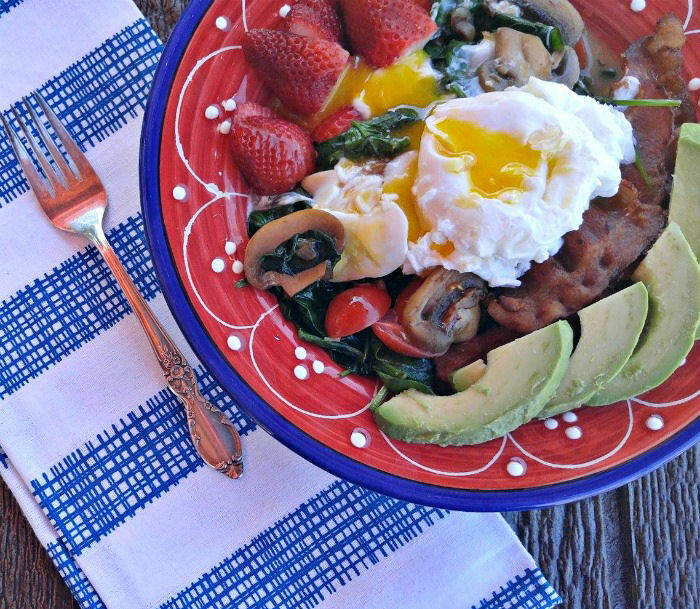 You won’t believe how fast and easy it is to make this caramelized mushroom breakfast bowl. 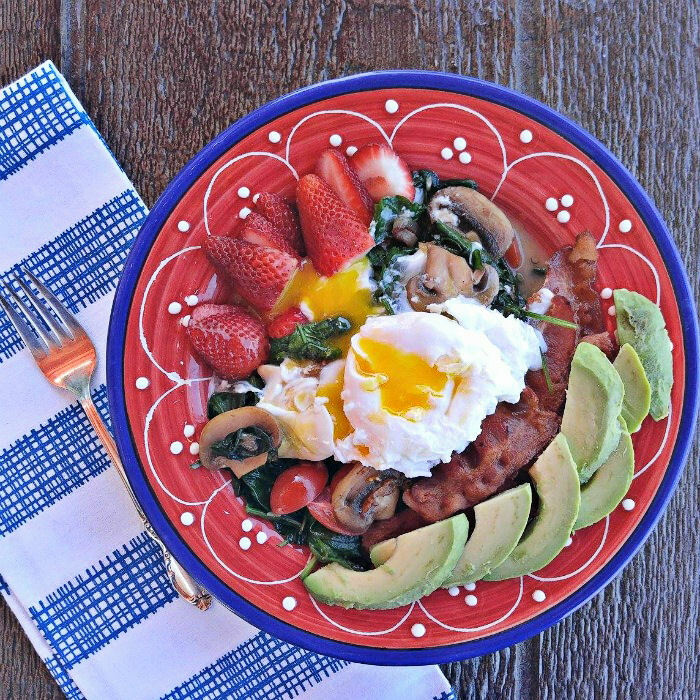 Whole30 breakfast ideas are big on protein, and have lots of flavor. Got about 15 minutes? The you can make this amazing breakfast! Just start by boiling your water with a bit of vinegar. It will come to the boil while you start cooking the other parts of the dish in a non stick pan. Cook the bacon first and allow it to drain on paper towels. Shallots and plump white mushrooms go into the same pan. (no need to add more oil!) Don’t crowd them. 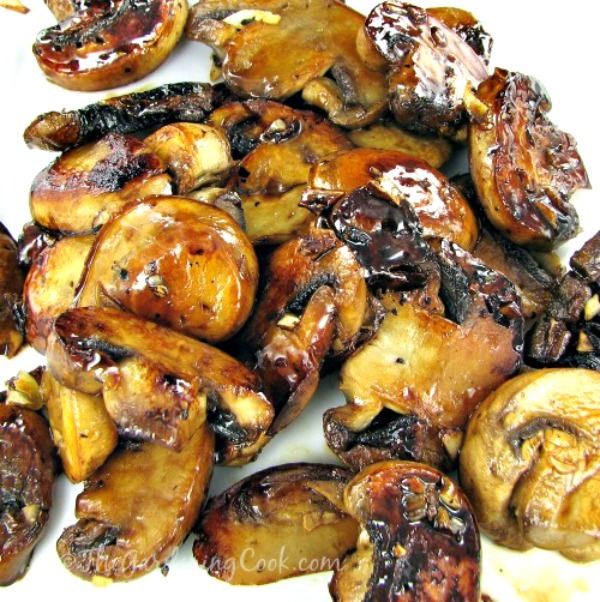 The key to caramelized mushrooms is to let them brown and take on the oil. If you crowd them too much, they will steam and that is not what you are after. 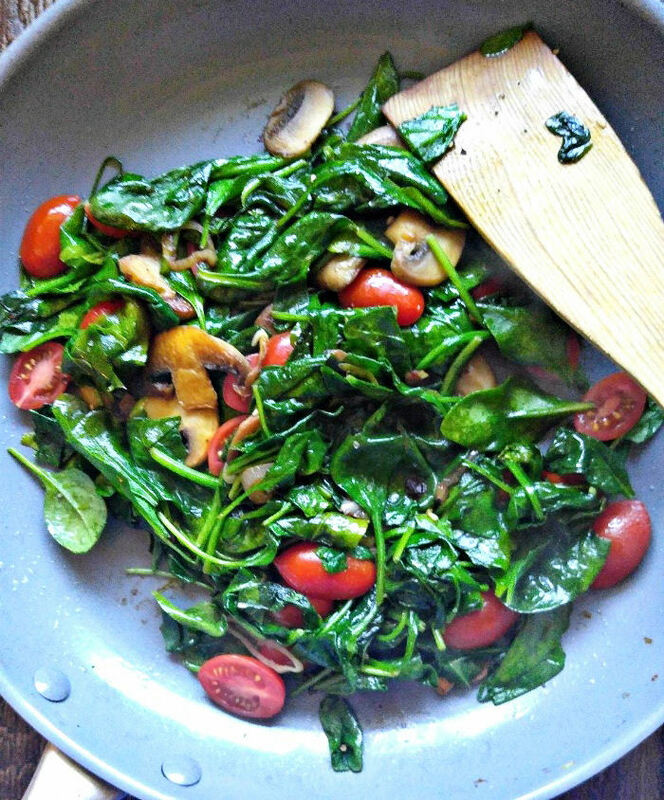 Once the shallots are translucent and the mushrooms have caramelized, stir in some minced garlic, the grape tomatoes and a big pan full of baby spinach. By now the water will have boiled and you can add the eggs to poach softly for about 3-4 minutes while you build the breakfast bowl. Layer over the vegetables first. They make a bed for everything else. Don’t they look amazing? 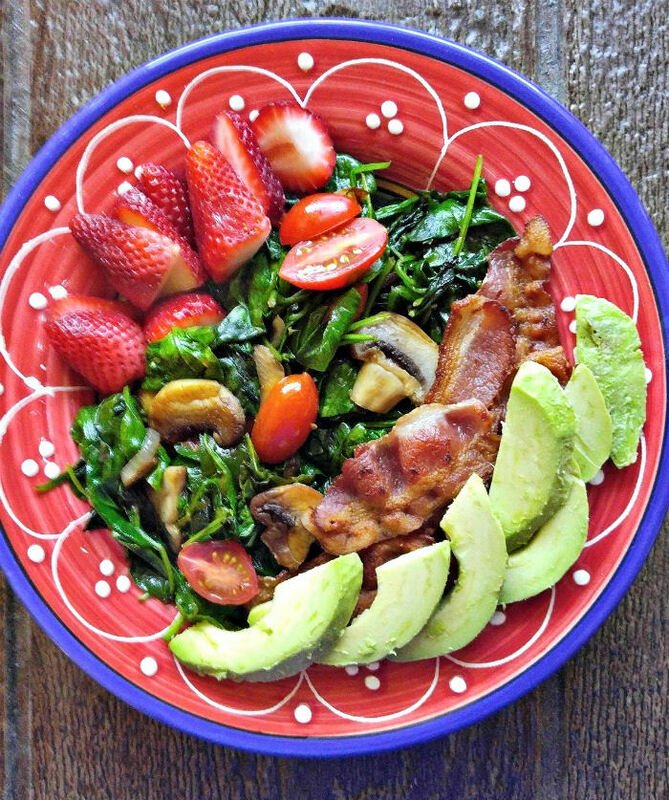 Next comes a few strawberries, the cooked bacon and some sliced avocado. Leave room in the center for the soft cooked egg. Finally, add the soft cooked eggs. I can’t wait to get a taste of this! It’s time for a taste test! The soft cooked egg oozes down over the layers of vegetables making each mouthful so full of flavor. The breakfast has healthy fats from the avocado, lots of protein from the eggs. It’s full of the flavor of the caramelized onions, mushrooms and garlic and even has a bit of sweetness to have at the end with the strawberries. It is filling, satisfying and totally fits into a Paleo or Whole30 diet plan. You won’t be hungry all morning, I promise! Who says dieting has to mean deprivation? Not this recipe, that’s for sure!! It makes sticking to the Whole30 diet plan a delight. Cook the bacon in a non stick pan until crisp. Remove to paper towels to drain. Add the mushrooms and shallots to the same pan and cook until the mushrooms have caramelized and the shallots are tender, about 3-4 minutes. Stir in the garlic and cook for about 30 seconds. Add the spinach and grape tomatoes and cook until the spinach wilts. Place the vegetable mixture into two serving bowls. Add the sliced strawberries and avocados along the edges. Put the bacon near the center of the bowl, leaving room for the eggs. Place the soft boiled eggs on top.